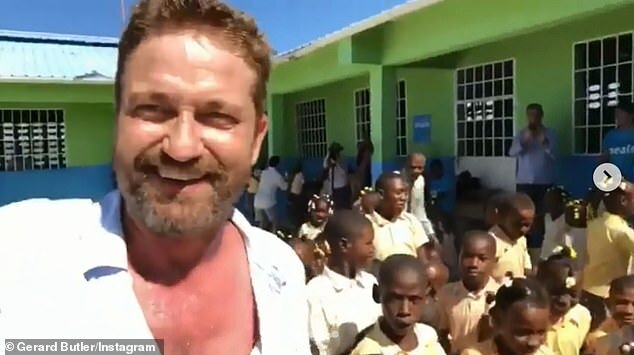 Gerard Butler has traveled to Haiti to meet the children who benefit from the help of a Scottish charity just weeks after his home was destroyed by the California wildfires. The actor, 49, visited the Caribbean country to highlight the work of Mary's Meals who feed school children from some of the poorest country's in the world. In Haiti alone, Mary's Meals feeds more than 40,000 children every day, while also providing food for pupils in 17 countries across Africa, Asia, Latin America, Eastern Europe, and the Caribbean. The charity feeds 1,361,586 children every school day and Butler shared one of these meals with a group of pupils from Ecole Communautaire Saint Michel de Morne Mouton in the town of Mirebalais in Haiti's Central Plateau. Butler visited the school with Mary's Meals founder and global chief executive, Magnus MacFarlane-Barrow, to see the charity's work first hand. He said: 'Mary's Meals is such a simple idea. I'm inspired by the genius behind it, and how it promotes responsibility in everybody. 'It's a very efficient way to essentially enhance the lives of so many in poor countries and it can be developed and extended so cheaply. 'I've been cheered up no end by these beautiful souls who, despite living in a country that has gone through so much hardship, have nothing but love to give. In Haiti, local volunteers prepare a nutritious school meal of rice and beans with a tasty sauce made from vegetables and fish for 41,831 pupils every school day. The charity began feeding 200 children in Malawi in 2002 and has since expanded around the world, beginning school feeding in Haiti in 2006. Butler was one of a host of celebrities who recently lost their homes in the fires which spread rapidly across California. On November 10 he returned to his home to find it completely destroyed by the fast-moving Woolsey fire. He shared an Instagram of the devastation as he stood in front of the remains of building and his burned out truck. The 48-year-old captioned it: 'Returned to my house in Malibu after evacuating. Heartbreaking time across California. And he ended with a heartfelt plea saying: 'If you can, support these brave men and women at SupportLAFD.org.